This course that alternates straight lines and successive turns, is an excellent gymnastic to break down a course and prepare each part of it. 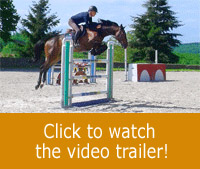 Despite the difficulty of this exercise, it is safe and it will become fun for the horse and rider. Too often, riders wander in the ring with no specific requirement. The horse drifts one meter to the right or to the left, and the rider doesn’t take any action in response to it. This lack of commitment is a vice leading to setbacks in competitions. Therefore, it is important to become aware of it when schooling via some specific exercises as the one Michel introduces in today’s lesson. The challenge of this exercise lies in staying on a precise marked track. The rider has to be accurate and has to stay balanced in order to follow the track. At the same time, the rider can test his capability to have a large angle view, to keep the same rhythm, to prepare his actions, and follow the movement between the straight line and the curve where the horse has to change lead. 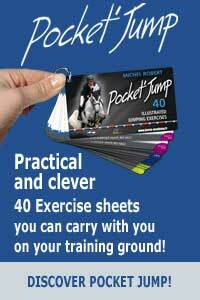 A very interesting exercise for the rider to practise a range of possible movements. During this session, Michel teaches Charlotte and her new horse Tito, a 7YO gelding. Charlotte starts at a trot in order to discover the exercise’s set-up. Then she practises it over ground poles at a canter. The first rounds at a trot are useful to set-up the correct cues between the rider and the horse. Michel advises the student on her position to prevent the horse to lean inside or run out. We can notice that each time the rider doesn’t anticipate her movements correctly, her horse tracks out. After few successful rounds, Michel sets up some cavalettis. Charlotte has to focus on her eyes to avoid staring at the fences or at the object that marks the track. Then, they will practise the same exercise with a stronger canter. The goal is to come closer to the condition of a course where difficulties come one after another which can amplify the rider’s weaknesses. By the end, the horse and rider get a full work having fun.